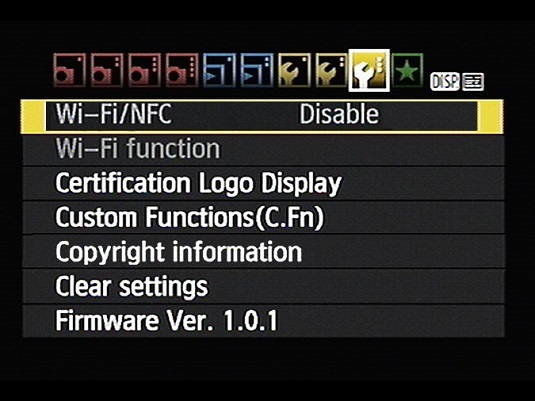 Open Setup Menu 3 and choose Wi-Fi/NFC. Press Set.On the screen that appears, highlight Enable. After you do so, the camera displays a check box related to NFC Connectivity. NFC stands for Near Field Communication. If your smartphone or other smart device is NFC capable, you may be able to establish a connection between it and the camera simply by placing the two devices next to each other. Some devices offer NFC only for limited functions, such as using Apple Pay on an iPhone. Anyway, if your device doesn’t offer NFC, press the DISP button to remove the check mark from the NFC box. Press again to enable the option. You see a screen asking you to enter a nickname for the camera. Select OK to display a keyboard input screen. 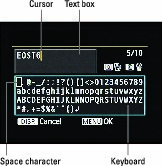 The screen is divided into two sections: the text box, which shows the current nickname, and the keyboard, which you use to enter new characters. In the text box, the yellow line indicates the text cursor. This name will identify your camera on your smart device. By default, the camera name is EOST6. If that’s okay with you, you don’t have to change the name; just skip to step 5. Press the Q button to toggle between the text entry box and the keyboard. The blue outline indicates which part of the screen is active. In the image above, the keyboard is active, as it is when you first open the screen. To delete the default nickname: First, press the Q button to activate the text box. Press the right cross key to move the cursor to the end of the text. Then press the Erase button; each press deletes one character. To enter new text: Again, press Q to toggle to the keyboard if needed. Then use the cross keys or Main dial to highlight a character. To enter the character, press Set. If you make a mistake, press Q to switch back to the text box, move the cursor as needed, and press the Erase button to remove the offending character. To enter an empty space, choose the very first character on the keyboard. Your camera nickname can be up to 10 characters long. You see a confirmation screen; select OK to move forward and exit to Setup Menu 3. The camera is now ready for Wi-Fi connection.